Our Client approached us as they were carrying out a major house renovation and they wanted to incorporate various controls in their home. After numerous meetings with the clients we ascertained that they wanted the following control systems installed. Lighting, HD TV, Blinds, Music, Gates, CCTV and WiFi. We prepared a quotation and went through it in depth with the client. After various adjustments we were instructed to proceed. This contract took place over a number of months during various stages of the renovation works. Firstly there was a comprehensive and extensive cabling plan which was installed prior to closing up the ceilings and walls. All these cables were taken back to a central Digitel Home Hub. The second part of the contract was the fitting of the various systems which was carried out intermittently as required. Finally was the programming of the system which was done over a 24 hour period ensuring that all parts were working cohesively? We for the duration of the contract had to work in conjunction with other contractors, namely the blind and security installer. We needed to ensure that the systems they installed were compatible and could be linked into the Smart Home, Home Automation system we provided. We now have a very happy customer with a very Smart Home!! Our client purchased an 18th Century house in need of major renovation and construction works. On this occasion we were late coming on board. The client had not considered Smart Home for the property however then saw some of our work and decided that he wanted to incorporate this into his new property. As a result the cabling infrastructure was not as we would have planned it to be however we were determined to work with what we had in order to ensure our clients got the home of their dreams. 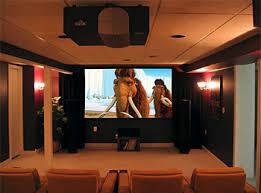 We met with the clients who confirmed they wanted HD TV, Music and a strong WiFi signal throughout the house. This was left all the more difficult by 18th Century 3 and 4 ft wall depth in places!! One of the most important aspects for our client was ease of use. We proposed an Elan Smart Home Control System, including a WiFi touch screen remote control, which the client went with. The client now has a top class Smart Home, Home Automation system installed in his home, with all cabling and wires again running back to a central Digital Home Hub, eliminating messy wires throughout the house. Prior to commencement of the new build our clients architect referred them to our showroom to discuss possibilities for their new home. Having gone through various options they decided to they wanted a HD TV and Music system installed in their contemporary new home. The great thing about this contract was that we were contacted at exactly the right time. By going through a set of plans with the clients we were able to pin point what they wanted and where they wanted it. This allowed us to draw up a comprehensive wiring plan for their electrician to ensure that all the cables and wires were in the correct place. This also allowed us to future proof our clients home as they eventually hope to install some more control systems within their house in the coming years. Following the wiring plan the electrician contacted us when he was ready and we provided him with suitable cable to pull throughout the home all coming back to a Digitel Home Hub. 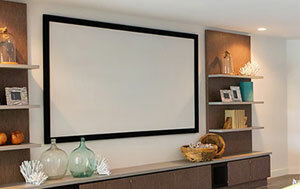 We then installed ceiling speakers in the necessary areas of the home. 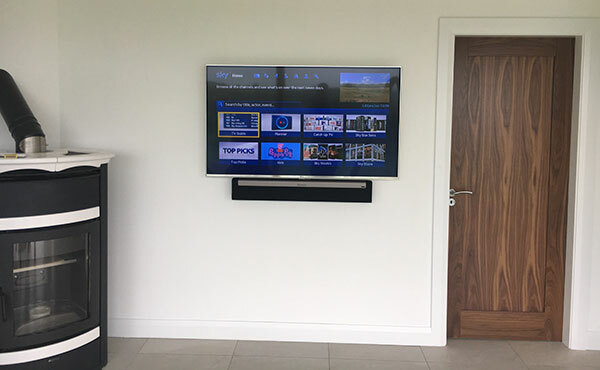 The clients were then able to just call us 2 weeks before they were ready to move in to put the finishing touches to their systems and install their Wall Mounted Televisions for Home Cinema and Multi Room Audio throughout. The housewarming party was great!! The Digitel team have carried out work installations for residential customers throughout Ireland and the North West including Donegal, Leitrim, Sligo, Cavan and Monaghan.